An artist's rendering of the Leisy Brewing Co. facilities, ca. 1890. Source: The Encyclopedia of Cleveland History. Abraham Leisy (b. 1801) and Katherina (Roher) Leisy (1805-1856) immigrated to the United States in 1855 along with their eight children: John (b. 1828), Jacob (b. 1830), Abraham (1834-1917), Isaac (1838-1892), August (b. 1840), Rudolph (b. 1842), Anna (1845-1923), and Henry (1847-1927). Their ancestral home had been Friedelsheim, Palatinate, Germany. They settled on a large farm in rural Iowa and became part of the Zion Mennonite Church in Donnellson. Several members of the Leisy family were brewers by trade, and Isaac was the first to leave the farm and seek a career as a brewer, finding employment at a brewery in Warsaw, Illinois and then in St. Louis, Missouri, working under William J. Lemp. Isaac returned to Germany for several years, working briefly at a brewery in Dürkheim. In 1862 Isaac returned to America and persuaded his father and two brothers, John and Rudolph, to purchase a brewery in Keokuk, Iowa. They started Leisy & Brothers Union Brewery that same year. After a decade of success in Keokuk, Isaac was able to persuade his brother August, who operated a furniture business in Missouri, and another brother Henry, who worked as a brewer in St. Louis and Milwaukee, to go into business together. 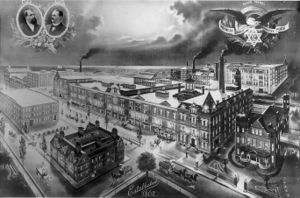 On 2 July 1873, the three Leisy brothers bought Frederick Haltnorth's brewery in Cleveland. They were assisted in part by relatives John, Jacob, and Henry Laysy, operators of local distillery, J. Laysy & Company. The new company was called Isaac Leisy & Company, as Isaac was the largest sharehold among the brothers. 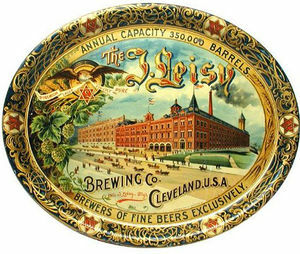 Within a year, the Leisy brewery was out-producing all other brewers in Cleveland. Isaac became the sole owner of the business in 1882. Isaac Leisy as sole owner and manager substantially enlarged the brewery, replacing the old buildings with modern ones occupying 8 acres of land. Production rose from 12,000 barrels in 1873 to over 90,000 in 1890. Leisy employed 75 workers, mostly German-Americans. After his death, son Otto I. Leisy (1864-1914) assumed control. Production grew to over 100,000 barrels in 1898, 300,000 in 1913, and 565,493 barrels in 1918. Saloons were purchased throughout Cleveland and elsewhere to protect sales. By the time Prohibition was enacted, the Leisy brewery owned and operated more than 200 drinking establishments or "outlets" as they were called. Prohibition put an end to the brewery's beer brewing business for a time, and production switched to a full line of flavored soft drinks and a non-alcoholic malt beverage called Leisy's Bevera. The beverage was sold at soda fountains, drug stores, grocers, hotels, restaurants, and amusement parks. However, sales were not profitable and the brewery closed in 1923. After Prohobition was repealed, Otto's son Herbert F. Leisy reestablished the brewing business. Operations ceased in 1959. Most of the extended family is no longer Mennonite. The Encyclopedia of Cleveland History. "Leisy Brewing Co." Web. 20 October 2013. http://ech.case.edu/cgi/article.pl?id=LBC1. "Leisy Brewing Company, Cleveland, Ohio." OhioBreweriana.com. 2001-2005. Web. 20 October 2013. http://www.ohiobreweriana.com/library/holdings/leisy.shtml. Krahn, Cornelius and Richard D. Thiessen. "Leisy family." Global Anabaptist Mennonite Encyclopedia Online. October 2013. Web. 22 Apr 2019. http://gameo.org/index.php?title=Leisy_family&oldid=102880. Krahn, Cornelius and Richard D. Thiessen. (October 2013). Leisy family. Global Anabaptist Mennonite Encyclopedia Online. Retrieved 22 April 2019, from http://gameo.org/index.php?title=Leisy_family&oldid=102880. Adapted by permission of Herald Press, Harrisonburg, Virginia, from Mennonite Encyclopedia, Vol. 3, p. 318. All rights reserved. This page was last modified on 21 October 2013, at 03:24.